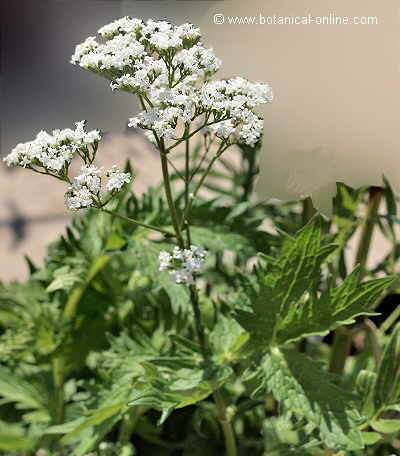 Photo of Valeriana officinalis L.
Perennial herb of the Valerian family -Valerianaceae- till 2 m.tall. Erect, robust stem, glabrous or pubescent, grooved. Pinnate compound leaves. Upper ones with shorter stalk or unstalked. White or pink flowers clustered in flat inflorescents, a central one in a higher position than the two side ones. Tubular calyx till 2.5 cm. long. In woods, riversides and humid grasslands.